Exploring story-telling as a way of revealing the identity of our work is at the heart of our Campaign. This emphasis on using story to unravel the distinctiveness of our practice led to our book, ‘This is Youth Work’ and is about to lead to the appearance of a web-based resource, ‘story-telling in youth work’. However it’s no secret that our perspective has been met with scorn by those wedded to the idea that youth work must be measured against prescribed outcomes. For such as the National Youth Agency and the National Council for Voluntary Youth Services, partners in the Catalyst Consortium with its rhetoric of evidence-based targeting, we were [and are] soft-bellied romantics, whilst they remain the hard-headed realists. Thus in recent weeks it has been fascinating to discover that the Campaign’s stance is not at all eccentric or impoverished. Within social research in general there continues to be a tension between qualitative and quantitative approaches to gathering evidence. Indeed back in the 1980’s this strain between competing views was described as a ‘paradigm war’. I’ve been drawn into understanding this clash, courtesy of a revealing piece, ‘Calling time on ‘anecdotal’ evidence’, written by Cathy Sharp of Research for Real., which follows and gives us a renewed sense that we are not at all on our own or off our trolleys! In addition Cathy furnished some excellent links, to which I’ll return in a separate post. However there’s a sting in the tail, certainly for me. Whilst Cathy’s piece appeared originally on Alliance for Useful Evidence I found it as a link on the newly created Centre for Youth Impact site. Now I’ve been less than generous in my welcome to this partnership of the NCVYS, Project Oracle and the Social Research Unit, pump-primed by the Cabinet Office – see more pseudo-scientific posturing in the service of competition. However there may be signs that the Centre is open to a greater diversity of approaches than I imagined. 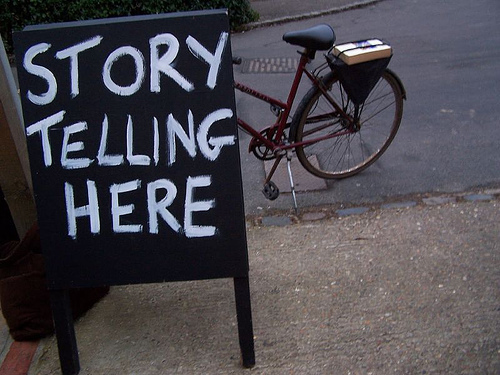 Hence posts to follow in the next few days on The Wider World of Story-Telling, The Centre for Youth Impact revisited and our own Story-Telling developments, the web-based resource and a new offer of workshops. Are you sitting comfortably? Then watch this space.